I was feeling a little too productive last week so I was able to film 3 nail art tutorials. It was Saturday so I went to the mall to have my facial treatment at Flawless. But the doctor who takes care of my skin was on leave so I canceled it and just went a little window shopping then went straight home. I usually go home late when I come from the mall but this day I looked at the clock and it was only 7pm so I thought I could still film a video for you guys. Paint splatters! I've seen this design around because I am also subscribed to my favorite nail gurus YouTube channels. They either used nail art thinner, hair dryer, a drinking straw or a nail dotter. I used a pin! You don't need to use the exact pin that I have. Sewing needle, safety pin and any other pins work fine, too. For this design, I painted the base color in white so that the paint splatters would just pop. But, you may also use black if you prefer. People on YouTube get excited when they see I use Caronia and ask if I am a Filipino. Yes, I am a Filipino and I intently use our brands so that people from other countries would get to know them, too. Caronia nail polishes are very pigmented and come in wide array of fun colors. And they are also really cheap so hoarding won't hurt your pocket. 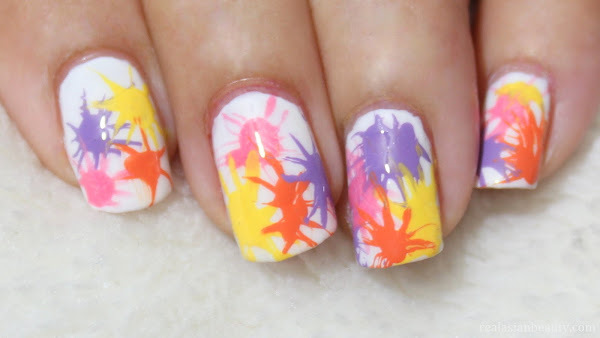 Anyway, here's the video on how to achieve the messy nail splatter design. It's really fun, quick and easy! I did both my hands in less than 30 minutes. The design is really meant to look messy so don't worry about trying to create perfect lines and shapes. Thank you for reading and I hope you like this nail art. Watch more videos and tutorials on my YouTube channel.